Home on the hill. Loving owner for 28 years! Reported as 1718-sf, but LARGER THAN TAX ROLL! Enter to warm, inviting living room that wraps to open kitchen w/breakfast bar. 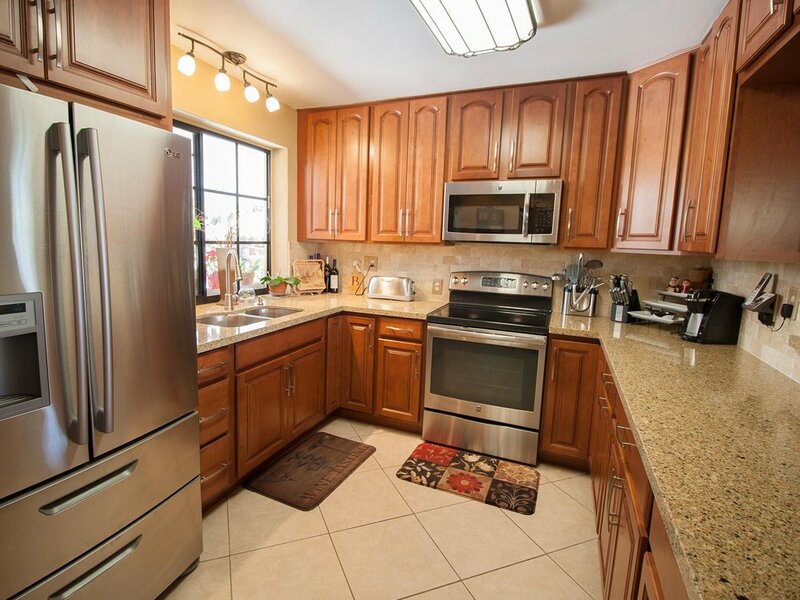 Recently updated kitchen w/wood cabinets, granite counters & stainless steel appliances overlooks pool paradise. Cozy family room with door to great patio. Stacked bedrooms. One with ensuite cabana bath & the other amply sized. Huge master BR suite is converted garage. Updated master bath w/whirlpool, private commode, dual sinks, large open shower. Master has its own mini-split AC unit! Utility room with washer/dryer & loads of storage space. Lushly landscaped backyard bliss with hideaway hut, inviting kidney-shaped pool, deep covered patio. This is where you can relax or party! 2008 metal roof. Accordion shutters. Newer AC units. Quiet comfort!